Good morning all! I hope you are looking forward to the weekend! Today I have another guest post, this time by Jenny from Lavish Layerings. She is a total sweetheart and I am very excited to show you what she’s done today. P.S. She totally made me cry! Hi everyone! I’m Jenny from Lavish Layerings (or you might know me as @bostonmerlin10 on Instagram), and I’m honored to be guest posting for Jessica today! Let me tell you, I can’t say enough good things about Jessica. Not only are her nails and blog fabulous, but she is one of the most kind and supportive people that I know when it comes to uplifting and promoting bloggers in the nail community. She works so hard on various projects which increase engagement within the community and I really respect and admire all that she does. On Jessica’s blog, she is always trying new nail art techniques and I think that she makes them very approachable to her readers. One of the things she does most often is tries techniques out in skittlette manicures (which I LOVE to do) and this makes a new technique seem less daunting when you only have to do it on one or two nails and it still gives a stunning finished look. 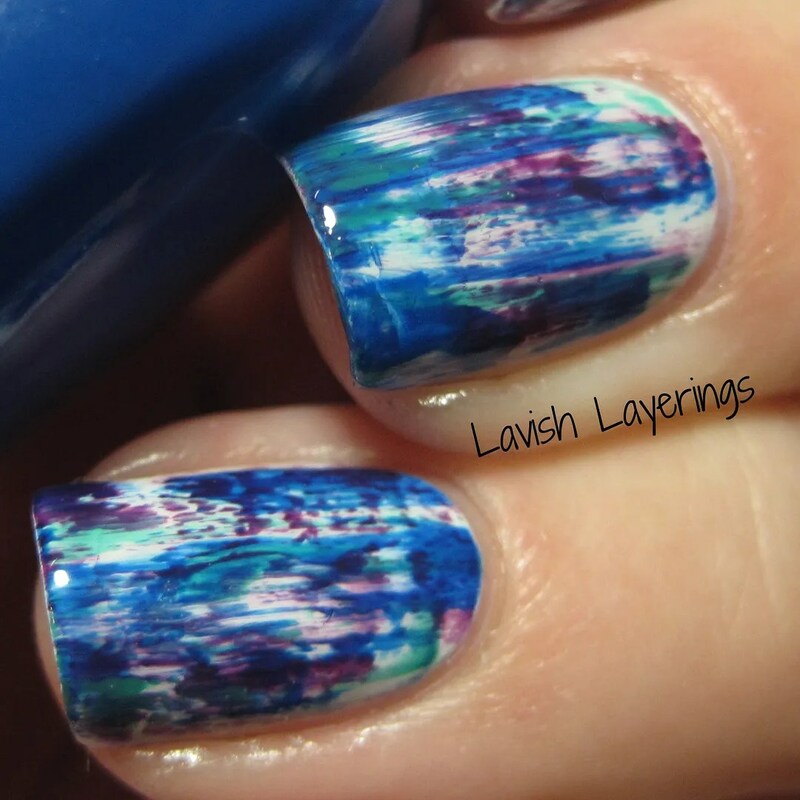 She makes nail art seem effortless, and I know that always makes me want to try it because I’m often pressed for time or just plain intimidated by some of the techniques out there. Today, I decided to share with you guys my favorite effortless nail art technique, the dry brush or distressed mani. (purple) to create my distressed look. There is absolutely nothing to this technique. All you do is start with your first color and wipe off the brush WELL on the lip of the bottle. You want to wipe it until the brush basically looks dry, so it will take several swipes. 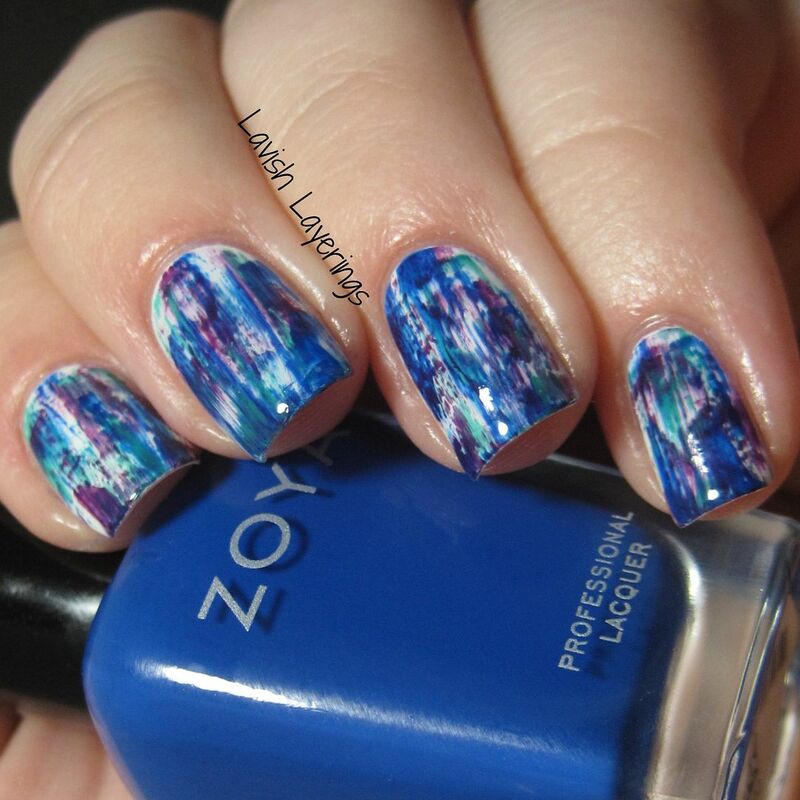 Then, you just drag the brush down your nail in random streaks. Repeat with the remaining colors and you have yourself a distressed look. 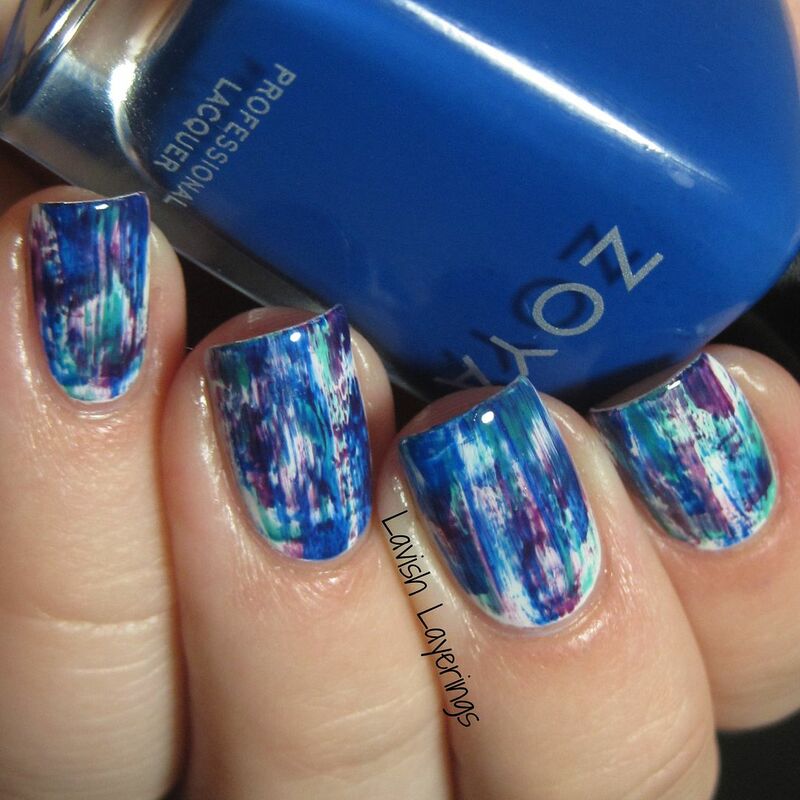 Finish off with topcoat and you are done! Now, in the original distressed mani tutorial by Chalkboard Nails (which is much better articulated than my description), you finish off the distressed look with streaks of black polish which really gives it a grungy vibe. You can definitely do that if you want, and I often do, but I really loved this one without the black. It just has sort of an abstract look. The colors look so pretty together too! 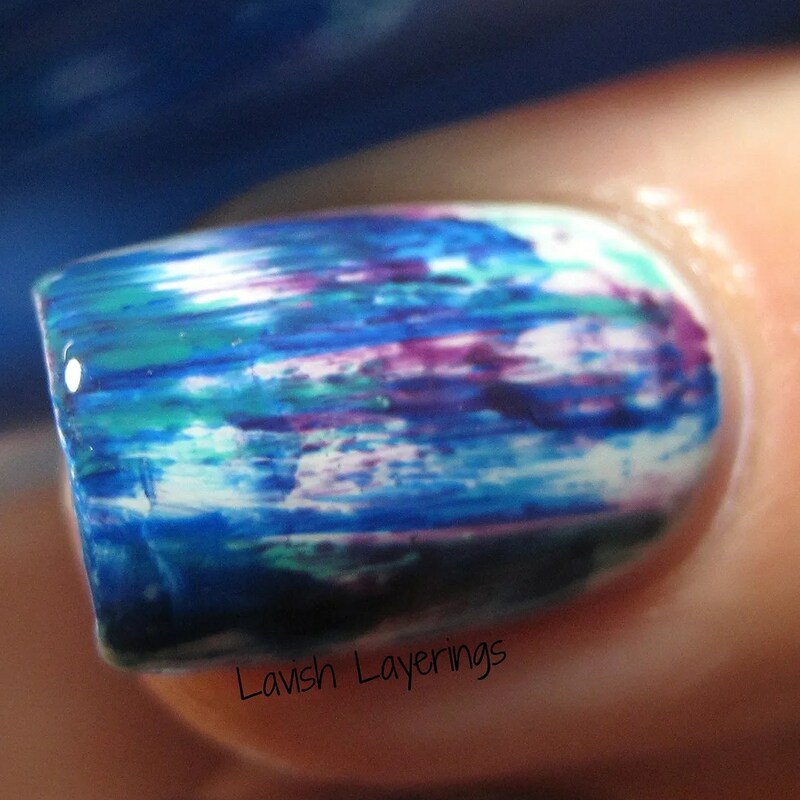 Pro Tip: If you happen to not wipe your brush off well enough and you get a thick swipe of polish instead of the nice broken look we are going for, just dip a nail art brush in acetone and lightly swipe over the area with too much polish. It will work like a charm to take that extra polish of and it will give you the brushstrokey look you are going for. Thank you guys so much for having me today and I’m wishing Jessica all of the best with her bundle of joy! Much love and prayers for a smooth delivery and healthy baby! i love this guest post!! those are some gorgeous polishes. So awesome! I love distressed manicures.